Fans of true crime cinema will greatly appreciate The Gunness Mystery, a 40-minute short doc that recently played as an Official Selection at Anderson, Indiana's Homegrown Hoosier Film Festival. 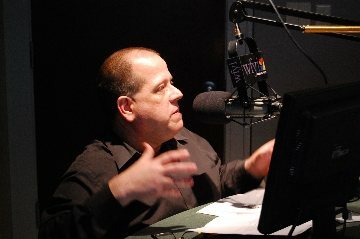 Directed by Stephen Ruminski and written/narrated by historian and LaPorte, Indiana teacher Bruce Johnson, The Gunness Mystery weaves together archival photos, historical documents and a wealth of Johnson's research to create an informative and compelling film about Belle Gunness, one of the most prolific female serial killers in history. Gunness, who was born in Norway but settled in the U.S. as a young woman, is fairly commonly known to most Hoosiers, as much out of morbid curiosity as it is a desire to be aware of Hoosier history. In the late 1800s, Gunness emigrated from a small town in Norway to the Chicago area. After her first husband died, Gunness relocated to a large LaPorte, Indiana farm with her foster children. Before long, she started taking out ads in Scandinavian newspapers looking for what amounted to single, lonely and difficult to track men. All the men were told to sell their belongings, bring the cash and to not tell anyone where they were going. Surprisingly, multiple men followed these strict but suspicious orders. Those who came were never seen again. Reports estimate that she killed anywhere from 25-40 individuals including both of her husband, virtually all of her suitors and her children. Her motives were said to largely be financial, as in payoffs on insurance policies and such. The Gunness Mystery accomplishes quite a bit in its sparse 40-minute running time and presents a wealth of information and photographic evidence that may very well be new to even the most studious devotee of serial killer history. Bruce Johnson has clearly done extraordinary research and uncovered rather remarkable documentation bringing to light all the mysteries that continue to follow Gunness to this day, including whether or not it was even her who was finally killed in a home fire that claimed other lives and finally led to the discovery of the many bodies on her property. The film is a rather straightforward documentary similar to what you would likely see on the History Channel, with a rather fundamental narration by Johnson and a more academic approach to presenting the material rather than anything someone like a Michael Moore or Morgan Spurlock would do. Of course, it wouldn't exactly be appropriate to make a documentary about one of history's most notorious serial killers an "entertaining" film. 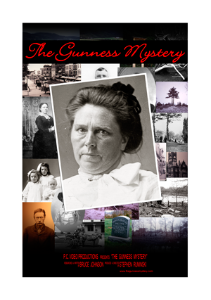 The Gunness Mystery does what it sets out to do by shedding light on the mystery around Belle Gunness and the years of horror in LaPorte, Indiana. To this day, Belle Gunness has left her psychological impact on the sociological psyche' of this modest sized Northwest Indiana city, and The Gunness Mystery reminds us why these are events that a community will never forget.